Agile development cycles churn out new releases of disruptive technologies as often as every quarter, making the high-tech industry one of unpredictable product cycles and rapid growth. Unnecessary expenses and an inability to secure a position at the forefront of emerging technologies threaten a company’s growth and profitability. By incorporating companies’ strategic business focuses, eSignature solutions digitize business-critical processes end-to-end for operational efficiency while delivering leading-edge technologies. This paper examines use cases from leading companies such as salesforce.com, McAfee and LinkedIn. 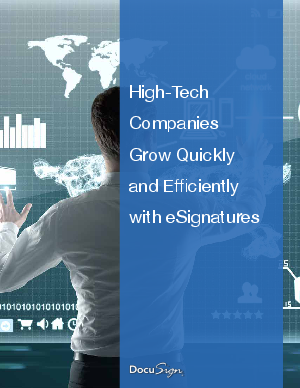 They illustrate how leading high-tech companies are leveraging eSignatures to manage efficiencies and costs with notable results of measurable and rapid gains on a global scale. Download now to discover the main benefits of using eSignature technologies for high-tech companies.